When you’re in the market for kitchen remodeling ideas, the most important thing, aside from functionality, is that your investment stands the test of time. Every era seems to have its own kitchen dos and don’ts, many of which can’t survive a decade. That’s a tremendous waste of your budget, not to mention a disappointment. So how do you invest in a kitchen that will look as beautiful years from now as the day that it was created? Opt for classic simplicity and overlook trends, no matter how popular they are right now. Stainless steel has been all the rage for awhile, and it is classic in professional kitchens. It can be argued that stainless will never go out of style, and it’s certainly easy to keep looking great. But stainless is not how history has played out so far. White is the color that’s really stood the test of time, and that’s true by a long shot. The National Kitchen and Bath Survey shows white at the top of the list in most popular kitchen colors. It’s also topped the list in every other year. This news is actually a boon for homeowners. Stainless appliances are much more expensive than white, so you can afford a better range and refrigerator in this ultra-classic color than you could in stainless. Vinyl has been around for ages, and there are some beautiful options. But vinyl also has a definite lifespan, and it’s not an especially long one. Think about long-term wear in addition to beauty and you’ll be happier. Wood will probably never go out of style, plus it’s more comfortable underfoot than the other contender, tile. Even under harsh wear, it can be stained, refinished, and still look beautiful decades from now. Chip a tile, and you’ll have to replace it. MSN Lifestyle also recommends wood for its sense of history, even when new. It can anchor the room in a way that few other materials can. As with stainless, granite is certainly experiencing its heyday. But think about the aesthetic qualities of granite, and you’ll see how easily this costly, if beautiful, material can look dated. Marble might be a better and more timeless choice. Most granite has pronounced colors and patterns. But are they something you’ll still want to live with in 15 years? Maybe, but maybe not. And it’s an expensive gamble. If you want a classic countertop, think about Carrara marble. This stone is much different from Calacatta marble, which has vivid whites and dramatic gray veining. Carrara marble has paler grays and softer whites, which avoids the bold fashion statement look. It’s nothing but timeless, and it’s not as expensive as granite. 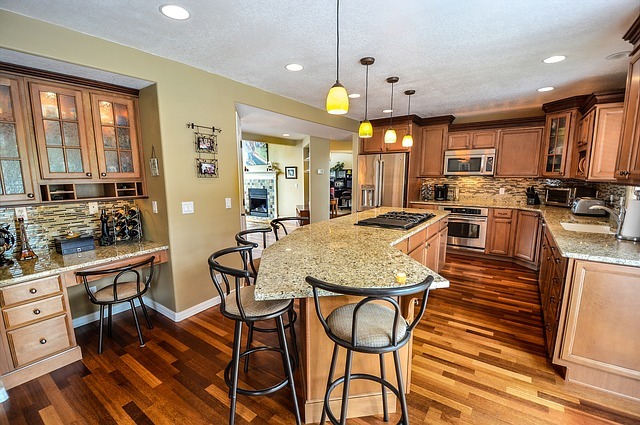 It does stain, but so does granite, and sealants take care of that. Shaker-style cabinets are a favorite, because the simple, clean lines span decor themes from minimalist urban to cozy rustic. They’re a fairly safe bet for almost any home. But what’s more important than style is storage. Decor magazines and websites are filled with clever ways to outfit your kitchen, from open shelves and freestanding cabinetry to traditional built-ins. Built-ins with loads of well-purposed storage should win out. Instead of old-fashioned boxy cabinets with nothing but hollows and shelves inside, look for smart storage such as pull-out organizers that maximize every inch of space. You don’t need a lazy Susan in the corner if those cupboards are accessible without it. Regardless of what you buy, choose quality over appearance every time. It’s the details that count, and what make any kitchen look beautiful years from now. Check the seams on your faucet and the wood joinery on your cabinets. Are they perfect, or can you spot defects? Perfection is attainable in both, and you’ll appreciate that as you use these fixtures daily. Where there’s a defect there’s the potential for separation. It’s tempting to choose a fixture that’s beautiful but not made well. Unfortunately, those choices don’t often last. So spend a little more and get quality where it counts. A kitchen remodel is one of the most expensive projects that you can take on, and This Old House says that it’s one of the best in giving you a return on that investment. You can dramatically improve the value of your home and your quality of life, so play it smart and think timeless instead of trendy. Ready to get started with your kitchen remodel? Download our mobile app and we’ll help you get matched to a top professional who can make your kitchen dreams a reality.